At noon today the 240,000 member strong Turkish Confederation of Public Sector Trade Unions (KESK) began a two day strike in response to "state terror implemented against mass protests across the country" in what may prove to be a significant development for the brave and burgeoning protest movement triggered by #occupygezi. At noon today the 240,000 member strong Turkish Confederation of Public Sector Trade Unions (KESK) began a two day strike in response to “state terror implemented against mass protests across the country” in what may prove to be a significant development for the brave and burgeoning protest movement triggered by #occupygezi. The Confederation of Progressive Trade Unions of Turkey (DISK), which boasts 327,000 members, has also adhered to the strike with sister unions currently deciding next steps. 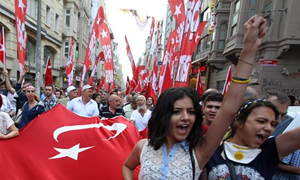 Despite the relative weakness of organised labour in Turkey (caused by decades of authoritarianism), the mobilising potential of these organisations will have a massive impact on the on-going protests. As I have written in these pages previously, the immersion of ‘establishment’ forces such as trade unions into youth-led civil society protest movements is never a simple affair. However, the support given by the Turkish unions adds an element of class conflict that can only enhance the message of the movement. This was seen to great effect in several countries during the Arab Spring. In Tunisia and Egypt it was arguably the unions that propelled and furthered the revolts against those countries’ dictatorial regimes. The independent Bahraini unions also called general strikes in support of the (failed) uprising. Just like the independent unions in the Arab Spring countries, their Turkish counterparts know a thing or two about political repression. It is for this reason that the Turkish unions’ entry into the protest movement is natural and obvious. While the plight of free-thinking journalists and the erosion of consultative democracy have been widely reported as causes of the current unrest, the treatment of trade unions, their members and leaders by successive Turkish governments has enjoyed less attention. The International Trade Union Confederation’s latest annual survey on the violation of trade union rights lists among other things the following charges against Turkey: police attacks on union protestors, arson attacks on protest camps, dismissals and intimidation of workers and activists, raids on union offices, and most worryingly the unjustified arrests of union members. At present, 72 KESK members have been on trial since last summer on bogus terrorism charges. Other examples include the imprisonment of 25 teachers and the prosecution of 111 workers for participating in a demonstration. These grave violations of union rights led the International Labour Organization just last summer to urge the Turkish government to “continue to take all the necessary measures to ensure a climate free from violence, pressure or threats of any kind so that workers and employers could fully and freely exercise their rights”. While the denial of trade unionists’ civil liberties is troubling, so are Turkey’s draconian anti-union laws that have been heavily censured by the European Court of Human Rights and the European Commission among others. Despite having recently overhauled its industrial relations legislation after years of being reprimanded by the ILO, the new law still falls way short of meeting internationally acceptable standards. In fact, the European Trade Union Confederation’s position is that the Turkish government will only meet the Copenhagen criteria for EU accession if its labour laws are revised to guarantee ILO standards. When a KESK spokesperson said last night that the government of prime minister Recep Tayyip Erdogan had “shown once again enmity to democracy”, they spoke with the wisdom of someone that’s been through it all before. The two-day strike called by KESK, while called in support of the repression of these current protests, is also about the right of unionists to enjoy their democratic freedoms. As such, trade unionists from across the globe should lend their voices to the resistance of the Turkish people.